Listen to "An Echo in the Bone" on your iOS and Android device. 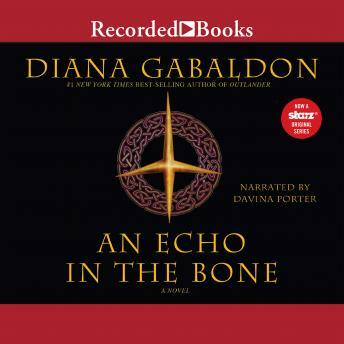 This seventh novel in author Diana Gabaldon's immensely popular Outlander saga takes listeners on a thrilling journey to 1777 America. Jamie Fraser knows from his time-traveling wife Claire that, no matter how unlikely it seems, America will win the Revolutionary War. But fighting for the eventual winner is no guarantee of safety. And worse still, the possibility of pointing a weapon at his own son-a young officer in the British army-haunts Jamie's every thought. I have been a Diana Gabaldon fan for years. This is the first time I was disappointed at the end of a book of hers. I am happy that obviously there will be another book in the series, but feel that there was not one single resolution to any of the subplots in this book (with the possible exception to the death of a beloved character). I am looking forward to seeing to what happens (to everyone) in the next novel. This books started a bit slowly but once I was into it I absolutely loved it. I feel like these characters are a part of my life now, even after over 50 hours of listening I was shocked when the book came to an end! I can ardly wait to download the next book. I have enjoyed all of the Outlander books and this one was certainly no exception. I am in awe of Gabaldon's ability to write so descriptively and I catch myself physically acting out what she is describing. Being from the western Piedmont of NC and a former history teacher, I particularly enjoyed the plot elements that took place in NC and the accuracy of the historical context in which the story took place. I am also such a Porter fan that when I finish this series, I will look for other books Porter narrates! Bravo!! Great story, not my favorite in the series still ,entertaining. I love Davina Porter's narration. This book has left many readers hanging into mid air regarding Claire and Jamie. I was not really impressed with this particular books ending. I love this author, narration is wonderful. Another amazing book in the series... I love the complex characters and rhe amazing backstories as well as the authentical historical background! I enjoyed this more than the previous two as the descriptions where less biological (and anatomical). Back to wonderfully rich descriptions of scenes and characters. Davina Porter remains the best narrator I have ever heard. I do listen at 1.25 or 1.5 speed as I think it is a bit slow for my taste.